Affectionately known as ‘Mr. YouTube’ after starting his javelin career by watching Javelin Throw videos on YouTube, Julius Yego will be seen fine-tuning his technique at the 3rd and final Liquid Telecom Athletix Grand Prix Series Meeting in Paarl on Thursday, 22 March 2018. While many chuckle at the surrealness of the prospect of learning via You Tube, no one chuckles at his ability to launch the 2.7m, 800g projectile far. Yego has a best of 92.72m which he threw to win the world title in 2015 in Beijing, China. Since 2015, Yego has not yet been able to go beyond the 85m mark in a season. He is, however, a feared competitor on the circuit. 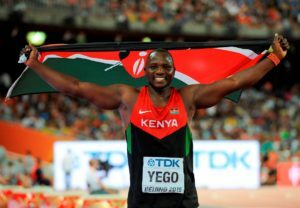 Standing at 1.75m in his sock feet and weighing in at 90kg, Yego has since then hired the services of a coach who has honed the power house’s technique to the point that Yego is always a contender for the podium. The 29-year-old battled with injury in 2017, causing him to finish 13th at the IAAF World Championships in London, a far cry from the World Championship gold (92.72m) and Olympic silver (88.24m) in 2015 and 2016, respectively. His best of 87.97m in 2017 came at the Kenyan trials in June, prior to him picking up the injury that saw him struggle at the London World Championships. Yego is, however, now once again fit and injury-free and after winning the Javelin competition at the Kenyan Commonwealth Games trials with a throw of 73.53m, he is looking for another opportunity through Thursday’s Meeting in Paarl to get his final preparations in for the 2018 Commonwealth Games on the Gold Cost, Australia. Yego is acutely aware that arch rival Johannes Vetter has already gone over 90m this year, but the German will not be at the Commonwealth Games. Yego has cast an eye on the likes of India’s Neeraj Chopra who has hit 85.94m this year and Hamish Peacock the Australian who is third on the 2018 world rankings with a throw of 83.63m. Western Province’s Rocco van Rooyen has a knack for unleashing all his big throws in his provinceand with a best of 85.39m from 2015, he could prove to be a thorn in Yego’s side if the Capetonian finds form.